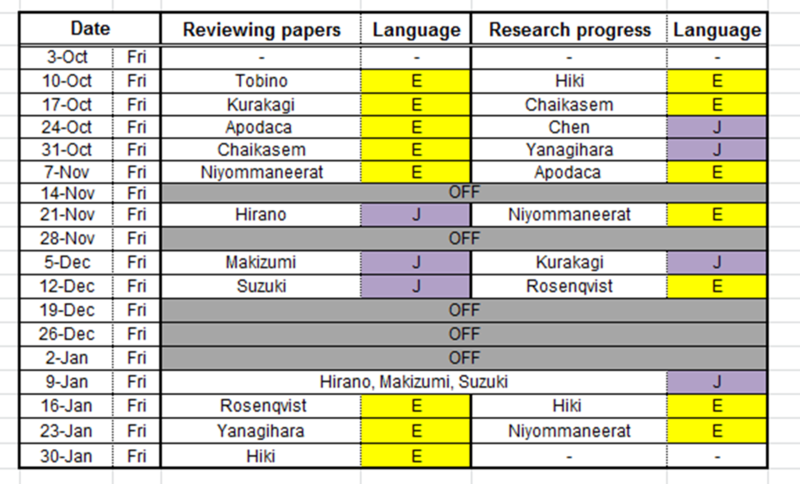 Almost every meeting is consisting of two parts; "Reviewing papers" and "Research progress". The schedule is as follows. This meeting starts at 4:40 PM, Friday. If you are interested in our activity, please join us. Tan C.H. et al., 2014, The role of quorum sensing signaling in EPS production and the assembly of a sludge community into aerobic granules, IMSE J., 8, 1186-1197. Dong M.M. and Rosario-Ortiz F.L., 2012, Photochemical formation of hydroxyl radical from effluent organic matter, Environ. Sci. Technol., 46, 3788-3794. Schlekat C.E. et al., 2010, Cross-species extrapolation of chronic nickel biotic legand model, Sci. Total Environ., 408, 6148-6157. Ratpukdi T. et al., 2009, Rapid fractionation of natural organic matter in water using a novel solid-phase extraction technique, Water Environ. Res., 81, 2299-2307. Turesson E.U. et al., 2007, Development and reproduction of the freshwater harpacticoid copepod Attheyella crassa for assessing sediment-associated toxicity, Aquat. Toxicol., 83, 180-189. Jiang W. et al., 2013, Effect of quorum quenching on the receptor performance, biofouling and biomass characteristics in membrane bioreactors, Water Res., 47, 187-196. Yang X. et al., 2014, Sunlight-induced changes in chromophores and fluorophores of wastewater-derived organic matter in receiving waters–The role of salinity, Water Res., 62, 281-292. Webb G. et al., 2011, Efficacy, environmental ersistence and non-target impacts of pyriproxyfen use against Aedes viilax in Australia, Proc. 7th Inter. Conf. Urban Pests, 151-170. Ralston‐Hooper K.J. et al., 2011, Use of GC× GC/TOF‐MS and LC/TOF‐MS for metabolomic analysis of Hyalella azteca chronically exposed to atrazine and its primary metabolite, desethylatrazine, J. Applied Toxicol., 31(5), 399-410. Garcia-Reyero N. et al., 2012, Assessment of chemical mixtures and groundwater effects onDaphnia magna transcriptomics, Environ. Sci. Technol., 46, 42-50.